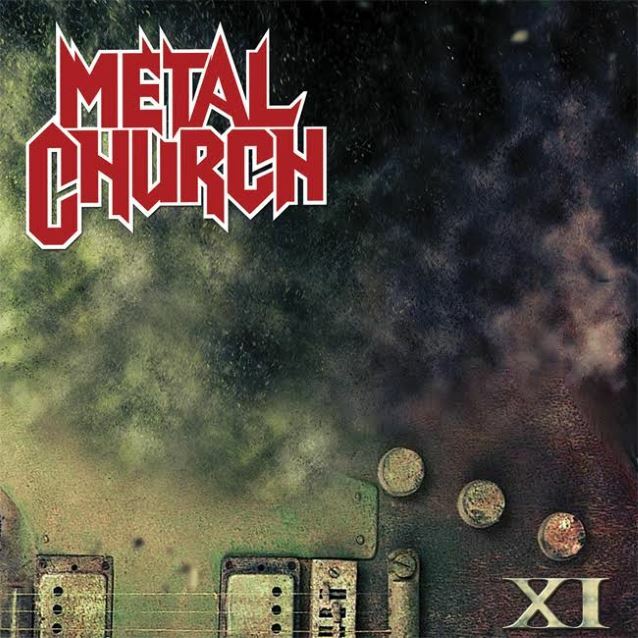 Interview: Metal Church’s Mike Howe talks latest album, XI. – Spotlight Report "The Best Entertainment Website in Oz"
Interview: Metal Church’s Mike Howe talks latest album, XI. Legendary U.S outfit, Metal Church, are back and stronger than ever. Their new album, XI, demonstrates the band’s ability to stand the test of time and keep producing well-crafted, solid classics. The band’s decision to reunite with singer Mike Howe in 2014 proved to be a resounding success and has resulted in an album that has most definitely been worth the wait. Thanks to our good friend, John Howarth of Nuclear Blast, we recently had a chat with Mike about what it’s been like to get back together with the band, the creative process behind XI, and his thoughts about the future of Metal Church. Enjoy! SR: Can you tell us about the writing process for your latest album, XI? MH: The writing process was different for Metal Church than it has been in the past… 25 years ago. It was a technological advance for me and brought me into the future, which was a great opportunity for me and Kurt to be able to write in the time constraints and living in different states, using the internet. Kurt would go into his studio and record rough tracks with drums and bass and send them over the internet to me. I would listen to them and get excited (laughs). And I would say, ‘Kurt, this is great stuff.’ Kurt would send me more and more and more. He was on the tear. He was inspired by the prospect of me possibly coming back to the band and wrote keeping me in mind. I was very impressed and very excited about his fresh riffs and his metal mastery being still intact. So, he sent me a bunch of songs and I said, ‘Kurt, we’ve got something here.’ I flew up to Seattle to his studio in his house and he put the songs up on his computer and threw a mic up there and I started singing out melodies over these riffs that he’d written. And thus, we had the technological advances of digital recording and computers to say, ‘Well alright, we’ve got these riffs and this melody going over this riff and it’s going great, but it doesn’t fit with this part. Can we take that part out and move that around?’ And Kurt would say, ‘Yeah, give me a second.’ And he’d move it around and get it out of there and we could carry on with our creative spark without having to stop and replay everything. So, that was a great tool for us this time around: we could basically do post production as we were writing the song. And that made for great chemistry and helped us keep going on and not have to stop. So, we did that for about three sessions over about four or five long days in his studio and we were just very excited and had a great time doing it. It was like we were transported back to being 20 years old. There were no pressures from back in the old days like a record company or a management company hovering over us trying to shape us into something that we were not. We just had a lot of fun and that was the main goal of what we wanted to do in the song writing process: to bring our youthful excitement back to heavy metal and writing it. I think we were successful in that. SR: How long did it take to get your live dynamic back and what was it like playing with the band again for the first time? MH: You know, it was very interesting. I approached this whole project with a very open mind and didn’t want to compare it to what Metal Church was in the past, but embrace the new Metal Church and what it was going to be today and in the future. And having that in mind really helped me to embrace it and have fun with it, you know? I was not trying to compare these players to past players or anything like that. I was just embracing the quality of players that are in the band now. And Kurt being on stage next to me was something that we’d always wanted to do and never had the chance to do. So this was kind of like an unfulfilled dream of both of ours: to actually be in the same band. So it was oddly very easy to step in and natural just to start playing together. And honestly, we had a session where I flew in on a Friday and rehearsed double sessions Saturday and Sunday. Then we took Monday off and did double sessions Tuesday, Wednesday, Thursday, and then started playing shows. MH: Yeah, we had a total of like six rehearsals and then were playing full shows and they were great. SR: What would you say were some unexpected or surprising things about rejoining the band? Did you have to face any particular challenges? MH: I guess the surprising part to me was that Kurt and I still had the same chemistry that we did 20 years ago. You know, you wonder how that’s going to be after such a long break. And we’re older now and we were like, ‘Do we still have that chemistry?’ And the surprise was that – yeah, it was – and stronger than ever, because we’re older and a little wiser now, hopefully, and a little more mature and can attack it in a less stressed and less pressured way than when we were younger. It became very organic and spontaneous to us, and it was just very exciting. We were trying to carry that feeling and just live in the moment and enjoy what’s going on and be spontaneous and organic and bring the joy to our music that you have as young kids when you just love to play music and that’s why you do it. And I think we’re doing that, so I think that’s what’s surprising about it. SR: Your No Tomorrow video, shot by Jamie Chamberlain, features the band playing in an old nuclear facility in Washington. What was that day like? MH: Well, that was a very surreal day because it was my first introduction to the other guys in the band. I’d never met them, strangely enough. Kurt and I did the writing process together. We did all that and the other band members were all home in their respective home towns and we’d send them tapes to hear things, but I’d never actually physically met them until the day we shot the video. So it was like, ‘Hey! We’re in a band together! Nice to meet you. Let’s rock!’ (laughs). So that was strange, but at the same time awesome; because, like I said, I’m trying to keep an open mind and a mature mind so we can enjoy the differences like a brand new band. And with that attitude, it’s just been a great, great experience for me – for all of us, I think. SR: Your voice sounds more powerful than ever on this album. How have you changed, as a singer and live performer, over the years? You’re obviously more relaxed, as you’ve said. Have you changed your approach in any other ways? MH: No, I think it’s as you’ve said: I’m more relaxed and more cognisant of my age and my maturity. I’m not as stressed and tense and putting as much pressure on myself as I did when I was 20-something years old. When you’re young, you really don’t know who you are. You just think, ‘Oh, I’ve got to be this’ or ‘I’ve got to be this.’ You put all these pressures on yourself to be great and you listen to other people’s opinions a little too much and try to incorporate that. When you’re older, you kind of know who you are and what you can do. That maturity and knowledge helps you to relax and be a better singer, without stress coming in. SR: When you were starting out all those years ago, who were your biggest musical influences? MH: Well in my early days I wanted to be like Rob Halford of Judas Priest. He was my hero and I wanted to emulate him. That also goes for Bon Scott of AC/DC. I wanted to have the attitude of Bon Scott. I was in a cover band where I grew up in Detroit, Michigan, and we did mostly Judas Priest and AC/DC songs. Just emulating them and singing their songs helped me develop my style and I feel like I’m kind of a mix between those two. SR: What are your thoughts on the current metal scene and do you get out to see much live stuff? MH: Well, in terms of my current influences and what I am today… Mike Howe, as a singer, loves hearing other singers. I don’t have a particular genre of music that I listen to. I have a love of all music and the art of music. I’m hungry for any kind of music because I’m a firm believer that every genre of music has some gems in it – for me and my taste. Art is a subjective thing; and, for me, and what I love to hear and what strikes me and talks to me is what makes music beautiful for anyone. It doesn’t have to be the same for that person or that person or that person. It’s just that whatever resonates with you is what you should go with and enjoy and take into your heart and soul. That’s what it’s about. So, I try to listen to all kinds of music and hear different styles. I may not agree with it all, but that’s okay. I guess I’m influenced by singer/song writers: pop singers; blues singers; jazz singers. I like to eat it up. SR: What was the last show you saw? MH: I saw a band called the Avett Brothers. They’re a full on band and they’re just a party, Americana band. You go out and stomp your feet and sing and have a great time. I see lots of shows. I love Gillian Welch – that American genre, you know? Steve Earle, Gillian Welch, and Dave Rawlings… The Milk Carton Kids. I really love harmony singers with acoustic guitars. That’s what blows me away the most: when they can set one mic up on the stage and have players stand around and use their professional dynamic – their playing and their singing – and step away from microphones and the sounds that they put out, without any amplification. That kind of stuff really impresses me. SR: You’ve got a European tour that takes you through to August. What are you most looking forward to about those dates? MH: You know, every night I’m excited about playing because every night we get to meet new Metal Church fans… old Metal Church fans and new Metal Church fans, but just people who enjoy our music and come up to us and say, ‘Your music means so much to me.’ That means the world to me – just being able to connect with fans and see them face to face and shake their hands and thank them for their support. To me, it’s a communal thing. It’s what music’s about. I’m lucky to make it, but I feel even more blessed to have people enjoy it and share it with me and say that they’ve enjoyed what I’ve done. I can’t even explain that feeling. I’m a lucky guy. I understand because the people I love and the people I think of that move me. I want to tell them how much their music means to me and I understand that and give that back to my fans in appreciation. SR: Speaking of fans, do you have any strange fan requests or funny tour stories you could share with us? MH: No, I mean I used to be really guarded. When I was younger, I was careful about my personal life and my privacy. Now I’m more open to people. Back then, I put a lot of pressure on myself because I felt that I owed the fans so much for buying our music and I wanted to give back by meeting them as much as I could. That would be part of the stress, because it was impossible to give back as much as they gave. Sometimes it would stress me out because I wouldn’t walk away from them when I was spent, emotionally. Nowadays, I don’t get easily emotionally spent. I’m calmer and I can take more. Now I can stand there for hours and meet people and take it and be grateful and not get worn out, emotionally.That’s that. As far as fans go, I believe that when you give yourself like that – openly – people are not so crazy. They feel that and they’re respectful of you and give of themselves and then walk away and let somebody else give of themselves. I haven’t had any crazy fan stuff go on at this point. Let’s hope it stays that way. SR: What have been your career highlights, so far? MH: Well, I mean I’ve been very blessed and have had a lot of career highlights. Just being in Metal Church is a career highlight for me. I feel very lucky to have found my way into Metal Church and to have found my way to Kurt Vanderhoof. He brought me to Metal Church to begin with and he’s brought me back to Metal Church again so I owe him a lot in my mind. He’s a good friend of mine and we’re really grateful to each other. But as far as what really means something to me in my career is a story that I tell about returning to Detroit where I grew up. Metal Church opened for my hero, Rob Halford and Judas Priest in an open-air amphitheater. My whole family came to see me. My mother knew that Rob Halford was a hero of mine who I wanted to meet, growing up. So, after the show, she said, ‘Mike, I want to get a picture with Rob because I know he’s a hero of yours.’ I said, ‘Okay, Mum. I’m sure Rob would love to do that. I’ll talk to him after the show backstage.’ So, we did our show and came back stage to the meet and greet tent. My Mum and her family were sitting around a table and across the other side of the meet and greet tent, there was Rob Halford. So I walk over to Rob and I go, ‘Hey Rob, can I ask you a favour?’ He’s like, ‘Sure thing, Mike.’ I said, ‘Well my mum asked if she could get her picture taken with you.’ He bends over to me and in his awesome British accent, he says, ‘Well you know, Mike, your mum is just like my mum. She already got over here with me and got her picture taken.’ And I look across the tent over at my mum who sees me talking to him and she looks like that little girl who got caught with her hand in the cookie jar. She was blushing. I was like, ‘Oh, Mum! That is so awesome.’ I said, ‘Thank you, Rob. That is so cool.’ He was like, ‘No problem, Mike.’ So I have this picture of my mum and Rob Halford that I cherish. SR: How old were you when that happened? MH: It was 1991, so I was 26. It was awesome. Those are the kinds of things that mean a lot to me…Personal things. Of course the fans mean a lot to me, but those personal stories mean a lot. SR: What’s your ultimate goal for Metal Church and do you have a new vision for the band now? MH: The ultimate goal for Kurt and I is to be in control of our own destinies and put out a product that we feel we’re proud of. We want to have creative control to say, ‘Look, this is who we are and who we feel we want to sound like and be represented as.’ That’s the main goal and I think we’ve accomplished that with this record. For the first time ever, there’s been no outside producers…no outside anything. We did it all and presented it, saying, ‘This is what we believe Metal Church should be and sound like and we hope you like it.’ All those other albums that you love we love too, but there were always other forces that made the mixing and the sound not exactly the way we wanted it. This time was sort of like a closure for us. We got to do something later in our life…We were so lucky that we got to come back and go, ‘Now we’re going to address something from our youth and put it out there.’ So that’s our goal, and as long as we can keep doing that and our fans keep showing up, that’s the ultimate goal. SR: Do you have any plans to tour Australia in the near future? MH: We would love to come to Australia and it’s all about the powers that be. We’re planting seeds and will hopefully get some offers that make it possible for us to come there.